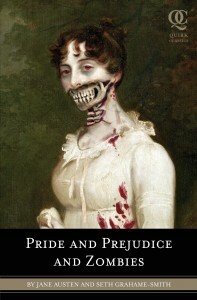 Once upon a time, back in April of 2009, a book was published wherein zombies were introduced into the Regency world of Jane Austen’s Pride and Prejudice. This quirky mashup sparked a slew of other strange and monstrous infusions featuring many of Jane Austen’s novels and a few other works by notable authors. With so many gruesomely dark mashups there was only one thing to do: start a book club. Dark Jane Austen Book Club was born. We are avid readers who enjoy classic literature as well as modern mayhem. What better way to merge our interests than to explore the world of mashups and vagaries? Zombies, vampires, werewolves, sea monsters…You name it. Introduce any one of those into a world of proper ladies in search of a wealthy man looking for a wife and you’ll have our interest. It may stem from our desire to engage in the fantasy and our cynical view that such things are absurd in reality. Still, ever since Pride and Prejudice and Zombies hit the bookshelves we’ve been dreaming of the day it would be made into a movie. Rumors flew for years. Announcements of various actors to play the roles of Elizabeth Bennet and Mr. Darcy fueled our imaginations always to be disappointed. It’s finally happening! The Pride and Prejudice and Zombies movie is coming to theaters in two weeks! This has us quite excited. Staring Lily James as Elizabeth Bennet and Sam Riley as Mr. Darcy we are on the edge of our seats–in proper lady’s fashion, of course. The previews have had us rapt with anticipation. To share our excitement we’re giving away three (3) swag packs, which include two full sized posters, two small posters, a post card, and tote. 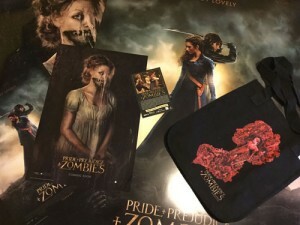 One lucky winner will also receive a copy of Pride and Prejudice and Zombies!